It began as an idea in the mind of 16 year old David Kawapit who was inspired by the Idle No More protests begun last year. In particular he admired the hunger strike protest of Chief Spence from the Appawapiskat First Nation. It was a small band of six youth and a spiritual advisor/guide which set out from the Cree community of Whapagoostui at the Mouth of the Great Whale River. It has a sister community of Inuit on the other shore of this river, Kuujjaaraapik First Nation. These are remote communities with no road access. The first leg in the travel will was to Chisasibi First Nation about 200 km to the south. The journey began in mid January when the temperatures in that part of Canada are regularly -30C and often as cold as -50C . 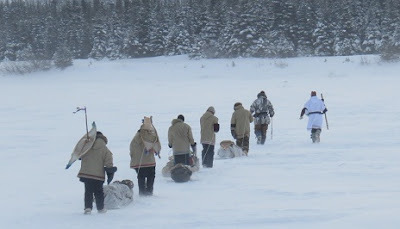 The group was to travel on snowshoes, dragging toboggans with all their gear including tents they would sleep in along the way when they were beyond the hospitality of other First Nations along they way as they passed through the historic territories of the Cree, the Anishinaabi, Algonquins, Mohawks and others. This was a spiritual and political journey. Only an aboriginal group with a close and spiritual tie to the land would confidently start out on such a potentially dangerous trek. It would require the wisdom of Elders, before they left and drawing on the age old skills and technology that one needed to survive. This was an historic route that would link First Nations Communities.. Along the way others would join in so that when they reached Ottawa there would be many times their numbers. It was thousands of aboriginal and non aboriginal people what filled the streets of Ottawa and traveled up to the front of the parliament buildings. These young people wanted the politicians and all of Canada to know that the Idle No More movement was not over. First Nation's people have grievances of long standing and they want the Conservative Government of Stephen Harper, which has recently passed legislation that affected First Nation's people negatively, (compounding the problems) know they wanted to be heard followed by some positive action. Prime Minister Stephen Harper chose not to be present to greet this group. He was at Trenton Military Base in Ontario welcoming two panda bears from China. It seems a couple of relatives of the raccoon family were more important than First Nation's youth and their concerns. Aboriginal struggles include having treaties honoured, services adequately delivered, respect for the contribution of the First Nation's people and fully recognizing their unique constitutionally guaranteed place in Canada. Canada being such a vast country treks of one kind or another across the country go on every years usually in the summer. I live not far from the Trans Canada Highway so there are may sightings each year of people walking, running, cycling, horseback riding etc across the country as a personal challenge for some and/or to raise funds for a charity. I also live close to the historic main fur trade route so there are frequent canoe trips across Canada in one direction or the other. reliving the voyageur adventure. Two of the many wonderful canoe trips I have always admired are about. Eric Sevareid (the journalist) on graduating from high school , in 1930, canoed from Minnesota to Hudson's Bay and the trip about two fellows canoed from New York City to Nome Alaska over two summers. These and countless others are all great adventures and fun to follow along. Historically there have been many great treks across parts of Canada. I have been fascinated by many of these. It always dismay be who people say Canadian history is boring. If you cared to read about the travels of many early Canadians it is anything but boring. Many adventurers, trappers, surveyors and others have set out to travel on the land of excitement or profit, Some paid with their life. Many kept diaries and maps we can enjoy today. One of these I admired the most is Samuel Hearne. He traveled a lot in the Barren Lands. He was the first European to travel overland to the Arctic. His diaries are a wonderful read. These travels were very challenging and strenuous treks that few would even consider today. I believe it was Hearne who spend the Summer and Fall one years doing a 3000 mile circuit around the eastern Barren Lands reaching Thompson Manitoba as Winter was setting in. Not wanting to be trapped at Thompson for the who Winter he set out in January alone to snowshoe to Fort Chippewa, 1000 miles away. He carried little counting on feeding and sheltering himself off the land along the way. He apparently thought little of doing this. Today if someone was to attempt it he could be considered to be foolish. It was his trip that I remembered when I learned of the Cree youth from Whapagoostui..First Nation. Not being a Catholic, it was with mild interest that I began to watch and read about the election of a new Pope. Being a cleric myself there was a kind of professional interest in any and all things religious both inside and outside institutions. I must admit the endless coverage in the press soon began to wear thin with me. I was relieved when finally a puff of white smoke indicated that the end was near. A new Pope had been selected. I must admit I was a little excited at the unexpected selection of Cardinal Jorges Mario Bergoglio of Argentina (of all places) far from the center of Catholic power and church politics. He chose the name of Francis for himself in honour of St. Francis of Assisi, everyone favourite Saint. This Pope was different, an outsider perhaps who lived "humbly and walked with his God" among and for the poor. He certainly has a style about him that differentiated him from the other "Princes of the Church". Perhaps, with this conclave of of conservative establishment Cardinals, the Holy Spirit may have worked in mysterious ways. Here perhaps was a Pope who could bring change to an institution which once promised change with Vatican II and has ever since retrenched restoring much of pre-Vatican II views and values. I wanted to know more about this man. Within five minutes of hearing about him being from Argentina I wanted to know where and what he did there during the "dirty war" under the Junta. There were a couple of articles about his failure to protect a couple of priests from being taken and tortured by the military government. It would not take long for the press to raise this failure of courage on his part. As the head of the Jesuits in Argentina, Father Bergoglio, was part of the religious establishment and in a position of influence if not political power. My opinion of Jorges Mario Bergoglio during the rule of the Junta in Argentina is that he supported the establishment, as evil as it was. Like all of the Catholic leadership at that time he" went along to get along." This is the history of establishment churches. when faced with great political and secular evil. Perhaps, we should not have expected more from him. For those who are not familiar with the dirty war of Argentina is was a period of their history when a group of right wing military generals took over and ruled the country in a cruel and dictatorial way. It was all part of Operation Condor, which the United States backed. Any opposition was viciously attacked and punished. People were taken into custody imprisoned, tortured and murdered. Some were even thrown alive out of airplanes into the ocean. Women prisoners who were pregnant had their babies taken away and given to government people to raise as their own. The mothers were then murdered. Years later some people came to learn that their "adoptive" parents were among the very people who murdered their biological parents. This was a style at the time of right wing military government in several South and Central American countries. North Americans may be more familiar with Chile and El Salvador at this time. Father Bergoglio must have know a lot about the cruel nature of the Junta. He like the Catholic Church of Argentina is guilty not for what he did but for what he didn't do in the face of true evil. It took 20 years before the Catholic Church of Argentina publicly admitted it's failings and apologized. Too little, too late. Father Bergoglio has this stain on his record. I like to think he is troubled by his failure of faith, which will motivate him. I would like to point out. in stature, Pope Francis is no Archbishop Oscar Romero who openly opposed the similar right wing government of El Salvador and died at the hands of a death squad as he raised the chalise at the end of the Eurcharist in his church. The leader of that death squad, Major Roberto D'Aubuisson, like so many of the military leaders in South and Central America was trained in part at the School of the Americas, a US military institution that trained officers in counter revolutionary tactics, including torture. It continues to do so today, in spite of regular protests calling for it's closure. Father Romero is considered one of the great Spiritual leaders of the 20th Century, along with Princess Elizabeth of Hesse, ( a granddaughter of Queen Victoria), Martin Luther King, Jr and Dietrich Bonhoeffer. In Westminster Abbey in London there is a gallery of sculptures of 20th Century Martyrs which includes these four who confronted evil directly. Pope Francis is a theological conservative like most of the other Cardinals. Those who are progressives never get to be invited to join this club. I would be interested if the Pope ever considered Liberation Theology which was very popular in South and Latin America among front time priests who were working with the poor. Archbishop Romero was an advocate of Liberation Theology." It was a moved movement that saw the role of religion was to transform society to change the lives of the poor. It was a left wing movement and made the hierarchy of the church and the political elites nervous for what it shared with Marxist social thinkers. The Catholic church eventually purged its clergy of this radical theology largely through the efforts of that Vatican Institution " Congregation for the Doctrine of the Faith" which was once in a previous form the institution that brought about the Inquisition.. Pope Benedict, when he was Father Ratzinger was involved with this institution that protected the purity of the Faith. Without a form of Liberation Theology I wonder if Pope Francis can bring about improvements among the poor. 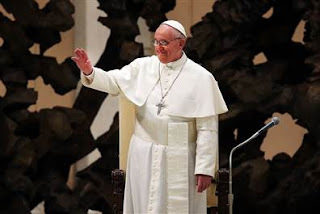 It seems to me Pope Francis concern for the poor , while it is sincere, springs out of a personal sense of piety. He has taken as his style life and religiosity that of humility, simple living and genuine love and empathy for others.. This is fine as far as it goes but does not go far enough, unless he by example and instruction can cause others to join him in a more charitable way of treating the poor. He seems to have made a virtue of being poor as he lives a poor style of life and associates with the poor. But being poor is no virtue. It is a cruel and humanity sapping existence in which people cannot realize their full life possibilities. To bring about change for the poor requires efforts to make them the "not poor" eventually. This requires systemic change. Society must be challenge to change in such ways as to improve the lot of the poor. Being charitable is not enough.. Systemic change is not well received. We need only learn about Venezuela to know this. Hugo Chavez made systemic change in Venezuela and reduced the number of poor and saw that the poor got important services to improve their lives. The Catholic Church in Venezuela even today after years of progressive social change sides with the rich and privileged. Hugo Chavez efforts are so under appreciated by the world that other leaders and governments won't even give him any credit suggesting Venezuela was better off before his government and will be even better off now his is dead. The Prime Minister of Canada certainly was one of these. He was either insincere or ignorant of the facts. probably both. The problem facing Pope Francis is how he will intervene on behalf of the poor. Is he willing to go far enough to challenge the powerful and support revolutionary ways of bringing about change. He needs to take of the mission, once seen as the role of the media, "of comforting the afflicted and afflicting the comfortable". I would hope he will succeed but I fear he may be merely a Pope with a different style and no real systemic change among the poor. It is hard to imagine his conservative theology will make it possible to speak to the changes many Catholics are looking for: married priest, women priest, gay marriage, abortion and contraception reform. With out theological changes in these areas I do not see Catholics moving back into the institutional church. His Holiness has many and great challenges ahead. One can only wish him well. Watching his papacy will make for interesting times. Last night a unique Canadian singer/songwriter, Stompin' Tom Connors, died at age 77. His original songs, which celebrate Canada, ordinary Canadians at work and play and what it means to be a Canadian, will live on to help future Canadians understand themselves. His music began at a time when a lot of Canadians were tempted to seek their fortune outside the country, particularly the United States. This was particularly true among those in the entertainment field. I can remember those years when a major concern in Canada was this problem of the "brain drain". Stompin' Tom's music help Canadians to mature culturally and come to appreciate what it means to be a Canadian. by looking as and celebrating who we really are. Stompin' Tom was an uncompromising Canadian Nationalist./ Patriot. He refused to follow others who moved to the United States to work. He wrote Canadian country and folk music that only spoke about Canada and the Canadian experience. So as a country singer he ignored Nashville and Texas and heart ache. He preferred Tillsonburg , Sudbury, Mattawa , PEI, the Gaspe. or countless other places. He seldom dwelled on heart ache instead he sang of accomplishments of the common man.. He celebrated Canada, coast to coast to coast. Below is his song that argues Canadians should stay home and help build our Nation. Stompin' Tom had connections to my part of Ontario. I have mentioned this before; my friend Dave Lachapelle, who lived with me for several years before he died was Stompin' Tom's father-in-law. His daughter was Stompin' Tom's first wife. I always hoped I might have got to meet the man myself but it never worked out. His son came several times to visit Dave, his grandfather. His mother stilled lives nearby in the Verner area south of my town. Stompin' Tom wrote about this area, of Northern Ontario.. Below is a song about Big Joe Mufferaw a legendary French Canadian bûcheron (lumberjack) based on a real larger than life person, Joseph Monferrand. He worked the Ottawa River cutting wood in the Winter near Mattawa and taking part in the log drive down the Ottawa River every Spring. Mattawa is to the east of where I live, still a small logging town. One of the most famous of Stompin' Tom songs was Sudbury Saturday Night, a celebration of the hard rock miners at their relaxation after a week of mining Nickel in the Sudbury area, to the east of where I live. Apparently, Stompin' Tom knew he was close to death. He wrote a touching message to his friends and fans. "It was a long hard bumpy road, but this great country kept me inspired with its beauty, character, and spirit, driving me to keep marching on and devoted to sing about its people and places that make Canada the greatest country in the world. 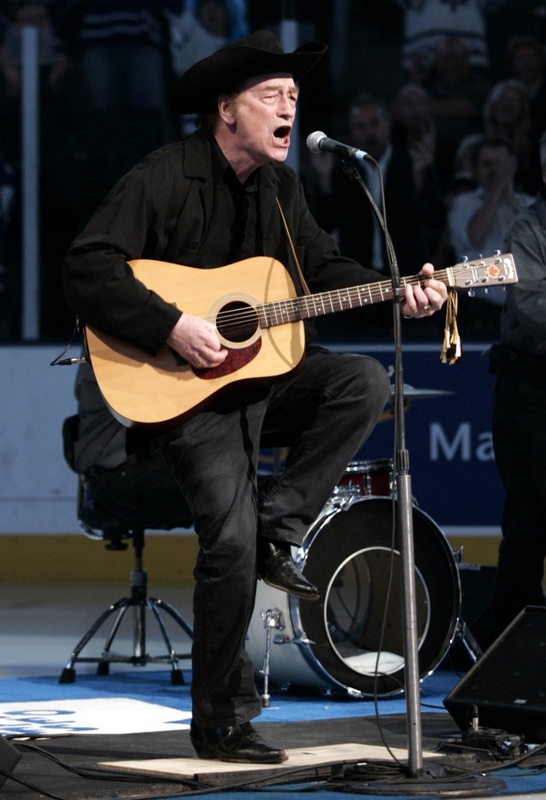 Canadians will be singing the songs for Stompin' Tom for years to come. I hope some singer/songwriter picks up the mantal and continues the tradition. Stompin' Tom did not sing much about the new Canada with the rich multi-cultural traditions being woven into the fabric of the country. He wrote very little about urban Canada or the Arctic. There are lots of wonderful Canadian experience in need of expression in song. Thanks for reminding us of who we are and what a wonderful country we share. The Academy award winning movie ARGO continues to be written about in Canada and by others who know the real story as a inaccurate account. Canadians have know that the escape of the American hostages from Iran was a Canadian enterprise which we have always called the Canadian Caper. Former President Carter, President of the United States at the time, has confirmed this public. ARGO is loosely based on the facts. It is in fact an American propaganda film, which shines a good light on the CIA and a rather negative light on the Iranians.and no light on Canada. All of this is very appropriate at of time of great hostility toward Iran, if you want to keep beating the drums of war. There is nothing wrong with taking dramatic license with an historical event but the film should have been presented at a fiction based on an historical event. Instead, the film creators went out of their way to promote it as a true account, time and time again, ad nauseam. I decided to review some of the events of the escape when I heard the CIA agent involved interviews with him saying the CIA was very happy to see the Canadians take credit at the time as if credit was not due. It is not as if the creators of the movie did not have lots of information available to create an accurate account which was just as thrilling as the fictional account. A docudrama has been made in Canada, with Gordon Pinsent taking the part of Ambassador Taylor. (This can be viewed on You tube) Many of the participants are still alive today and could have been interviewed.. Below is an interesting video which has the actual people involved explaining what transpired.. It is fascinating to watch. How sad that only about 30,000 people have cared to hear these first person accounts. Canadians are accustomed to being under appreciated by Americans. We certainly are used to Americans puffing themselves up with all their sense of exceptionalism, the national political myth. BUT when an historic event is claimed to be true it should do it best to be true to the historical record. Sadly many will accept this film as the historic record for years to come. Just as the untrue reasons for dropping the bomb on Hiroshima and Nagasaki are repeated today, The propaganda for that tragedy began right away after the event. It does not take much research to discover the historic truths. History deserve better and more careful treatment. Here is Jimmy Carter speaking about the film ARGO in a speech at Queen University, which he has repeated several times.